Putting greens are a fun addition to any home’s outdoor space, and getting one is not as difficult as you may think. Depending on the amount of space you have, you can create a green with a single hole or a more elaborate set-up that you and your family can enjoy whenever you’d like. Turf walkways are good additions to putting greens, since they allow you to walk less on the green itself. Even if you don’t have a putting green, a turf walkway can be a good addition to your outdoor space, as it will add the natural appearance of greenery combined with the low-maintenance benefits of artificial turf. How long does it take to install a putting green or turf walkway? The answer to this question varies depending on the size of job. For a single putting green or turf walkway, the installation process can be as short as a day; however, larger areas could take slightly longer. In each instance, the area must first be prepped, and then the artificial turf must be fitted, edged, and groomed. As soon as the installation process is complete, your putting green or walkway will be ready for use. Do I have to water artificial turf? 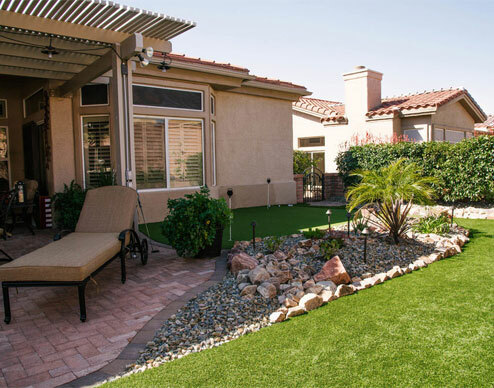 The turf used for your putting green or walkway will never have to be watered, which is a major advantage in Tucson’s climate. This is part of the reason why the popularity of artificial turf has exploded across the Southwest. Keep in mind that there are a few maintenance tasks that you should perform to keep your artificial grass in top condition. Rinsing the turf periodically will keep it looking its best. Occasional raking can also help to reduce the risk of matting. This is especially important for putting greens, since you’ll want a smooth surface. Having your artificial turf professionally groomed periodically will ensure that it stays in top condition for years to come. Does artificial turf get too hot to walk on barefoot? An ongoing myth about artificial turf is that it gets too hot to walk on. Today’s turf is designed with blades that reflect heat. Durafill further reduces the amount of heat that is transferred from the base layer to the blades. As a result, you will be comfortable walking on your turf walkway or putting green with or without shoes. 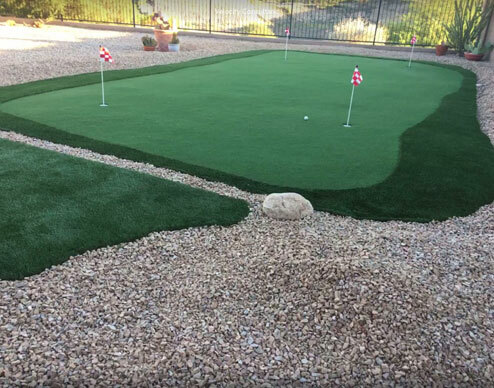 Are you interested in installing a putting green or turf walkway in Tucson? Call A New Creation to learn more about our installation process and how we can help you get the outdoor space of your dreams. Call (520) 730-3299 to talk to a team member today.